Rebellion, the publisher of the 2018 Roy of the Rovers reboot, has teamed up with the National Literacy Trust this week to give away 10,000 books from the brand new series to reluctant readers across the United Kingdom. 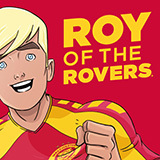 The return of Roy of the Rovers has been greeted with enthusiasm across the UK, especially in the football community, where the comic and its central character, Roy Race, are thought of as icons – and which also introduced generations of football fans to reading for pleasure. This week’s giveaway includes 5000 copies of Roy of the Rovers: Scouted, an illustrated novel by celebrated children’s author Tom Palmer, and 5000 copies of Roy of the Rovers: Kick-Off, by best-selling comics writer Rob Williams (2000 AD, Suicide Squad) and artist Ben Willsher (2000 AD, Doctor Who Magazine). The books are being distributed through National Literacy Trust Hubs - areas where the charity works with communities and local partners to tackle low literacy levels that are seriously impacting on people’s lives. The National Literacy Trust Hubs that will receive books through this giveaway include Swindon, the North Yorkshire Coast, Peterborough, Middlesbrough, Bradford, Nottingham, Hastings, and Stoke-on-Trent. “I loved Roy of the Rovers growing up, so I’m delighted that the adventures of Roy Race and Melchester Rovers are back to inspire a whole new generation of children to get reading. We’ve seen firsthand how bringing football into the classroom can level the playing field for children who have fallen behind in their reading, particularly those from disadvantaged backgrounds, where we focus our work. Rebellion and the National Literacy Trust will be launching an exciting competition for schools in 2019. Teachers can find out more and register their interest in taking part from today here.